If the gulf were my bathtub, how much oil would I add to equal the BP spill of 2010? Let's say BP spills 5 million liters of oil. 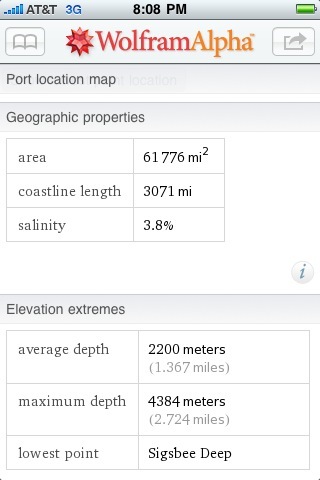 Since a cubic meter is 1000 liters, this is 5000 cubic meters. A square mile is 2.6*10^6 square meters. 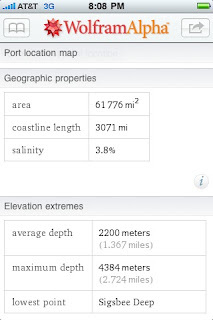 So the gulf is about about 1.6*10^11 square meters by 2000 meters or about 3.2*10^14 cubic meters. So the ratio of oil volume to gulf volume is about 1/31,720,000. If the my bathtub holds 20 liters, I would need to add about 1/1586 of a milliliter of oil to resemble the total Deepwater Horizon spill. I doubt I'd notice it. Of course the local effects of the oil are very large. I'm also pretty sure I've made some arithmetic errors (it's quite late and, alas, I rarely do even arithmetic these days). Still, the gulf is really vast. And the gulf is deeper than it is wide, but your bathtub is wider than it is deep. Correct me if I'm wrong, but you need to be looking at the surface area, not the total water volume right? In the gulf much (most?) of oil seems to be moving in vast streams through the depths, so it is not behaving as an oil spilt from a floating ship. I would like to see some real analysis though. Oil doesn't always float. Oil is compressible and at some point under pressure it no longer floats. Also, quantities are misleading. It doesn't take much DDT to kill a pond. So the biological impact of the oil on the gulf is not merely the mechanical amount.